Decades ago, Imagineering had the bold notion to start the 21st century 18 years early by unveiling the “future” at Epcot in 1982. This positive look at tomorrow had a numbing effect on the bleak vistas depicted in George Orwell’s dystopian novel, 1984. As a kid beginning my career at Disneyland in the mid 1960s, both of these “futures” were far off from a universe where Disneyland was the only Disney park, Mr. Lincoln was a state of the art attraction, and everything operated under Walt Disney’s guidance. Today, while there is a new set of “futures” to explore, the time has come for me to evolve my role at Walt Disney Imagineering. Beginning this February, I will be transitioning to a position as a part time advisor. While I will not be here on a regular basis, I will continue to be available to any and all of you as needs arise. Though my time will be limited, my passion for the magic WDI creates will be just as strong. Since early last year, I have been thinking about what I would say to all of you when this time arrived. It has been a wondrous 47 years spanning the opening of Walt Disney World to Big Thunder and Star Tours from Epcot’s original Journey into Imagination to Disneyland Paris and Indiana Jones. The Imagineers I have known and shared these times with have provided invaluable experiences not to be found anywhere else on earth. As one of the lucky second-generation Imagineers, I had the unique opportunity to experience firsthand the core philosophies of our company. I was fortunate enough to work with Claude Coats, Marc Davis, John Hench and the many others who built this industry alongside Walt Disney. I was able to soak up their wisdom and partner with them on creative projects. I have passed forward many of their key philosophies, and as our culture and scope have evolved, I have tried to balance my support of these foundations, with the business of charting “what’s next.” Now the 21st century brings a new reality for the first time, the younger generation is master of the key technologies driving the future. While upcoming generations deal with tech tools that are evolving almost daily, many of Disney’s keystone philosophies remain stable and relevant. These philosophies help define our creative edge to a world that is eager for aspirational content. With no particular order, here are five that continue to inspire me, and I think you may find useful in shaping “creative futures” for the years to come. Legendary Imagineer Marc Davis once said, “We don’t really have a story with a beginning, an end or a plot It’s more a series of experiences building up to a climax.” Guests still want to be astonished, and our best attractions deliver that wow factor with visions and emotions. I always start with the notion that it is the 20th repeat ride, not the first that is the most important. Park experiences are by nature less able to focus on linear stories and tangible feelings than motion pictures. Unlike a movie, what separates an OK attraction from a great one is that people find themselves “in” the great ones. They have been taken to a place they couldn’t have imagined without Disney. How intriguingly we craft the level of guest engagement has direct bearing on desire for an umpteenth ride down the same track. In Fantasyland, a simple line of dialogue heralds the beginning of one of the most aspirational ride experiences ever created; “Come on everybody here we go!” After riding Peter Pan, futurist Ray Bradbury was moved to write; “Walt, I’ll be eternally grateful that you made it possible for me to sail from a child’s window, out over moonlit London in a galleon on its way to the stars!” Despite the fact that by today’s standards Peter Pan’s technology is dated, its mystique has remained unwavering. The WDI challenge is finding ways to ensure today’s more sophisticated experiences have similar intangible qualities that provide groundwork for lasting appeal. One of Walt Disney’s ways of overcoming what sophisticates tended to see as corny or sentimental was his absolute belief in sincerity. Defending Disney’s signature animation style in the movie Cinderella, Walt expressed what is to me a true hallmark of the Disney difference: “You have to believe in the honesty of Cinderella’s world, or you will not believe in the magic as it unfolds around her either.” The power of sincerity to win over an audience is “front and center” in the new Cars Land. Here, a truly believable environment fuses with the fantastic to give rise to new reality. Awhile back there was talk about the elusive “Disney Difference.” What the “difference” is may be open to various interpretations, but I see it centered on cultivating “Valuable Mental Real Estate.” Since the early days at the studio, Disney has excelled in focusing diverse talents on plussing core ideas. Enhanced value stems from something as simple as the emotional appeal of Epcot’s Figment character in comparison to hundreds of other generic dragons. When the whole team undertakes a mission to make “our dragon” stand out in every way, mental real estate values go up. At Imagineering, where we must deal with equal parts of controlled insanity and disciplined evaluation, this can be complicated. Years ago, who else could have come up with the crazy idea for Flying Saucers and then make the concept work! (Sort of). Piloting flying saucers is every kid’s dream, and in spite of the ride’s technical shortcomings, people will forever recall the Flying Saucers as an E ticket. This rides aspirational, “bucket list”, once-in-a-lifetime intrigue, more than made up for any less than stellar performance. Current culture and the structure of our company are vastly different from the time when I began my career. Yet within that dynamic, hallmark values continue to add major appeal to today’s more socially sensitive content. Disney’s feature Beauty and the Beast shared many hallmarks with its ancestor Snow White, but it spoke to a vastly different audience with a finer tuned voice. Likewise, the more recent Tangled fuses traditional Disney values with relevancy aimed at a new generation. Beyond the WDI walls, Pixar and Marvel achieve a consistency of success in their fast paced arenas. Each Pixar team is confident enough in their individual productions to freely reach out and tap into links that insure Pixar’s hallmark differentiators are a part of every project. Marvel has taken a different route, tasking individual creative teams to bridge their storylines under an overarching and epic saga. Regardless of the diversity of deliverables, hallmark values are key to all Disney entities, and everyone needs to be alert to where they reside, and how and why to fuse them to the DNA of a project. At both ends of a career one of the most important working relationships is achieved through mentoring. When you are in your 20s and 30s it critical to find a mentor you can admire and trust. What proved most valuable for me was a mentoring partnership that skipped a full generation. A wide age gap creates a cross-generational opportunity for two-way learning. A young mentee sees a mentor’s still bright light as support for his or her own growing visibility, and the gap vanquishes the sense of competition. In a complementary way, a mentor’s satisfaction is fueled by the growing knowledge and skills transferred to their younger partner. My mentor was Imagineering legend Claude Coats, nearly four decades my senior. For Pixar director Pete Docter, his mentors were animation giants Joe Grant and Ollie Johnson. Pete and I absorbed as much knowledge as we possibly could during a period of growth in our careers. I would like to think our esteemed mentors also drew inspiration from our curiosity and unexplored visions! A mentorship is not a few hours of counseling every so often; it is pulling together on real projects, with business/creative goals and knowledge gains to be made by both sides. This is the partnership I had with Claude Coats, and we remained lifetime friends because of our shared working time together. No company is perfect, and like any other corporation Disney has its own politics and challenges. We are artists, engineers, managers, filmmakers and musicians. But our company is unique; there is no place like it on earth. We are lucky. At the end of the day, it is my hope that this letter will add to the special culture that I have been privileged to grow in. I see the probability for that happening in my interactions with younger Imagineers like Michel, Josh, Zach, Dylan, Laura, Manuel, Vanessa and Brandon, which are beyond rewarding to me. At a time when “unlearning” is as critical as “learning,” it’s important to listen to the way these people think and enjoy the things they do. Creativity I have mined from their game-changing perspectives, now effectively influences my own design process. I hope that when their careers peak some decades from now, they will look back on our time together as I value the time I was able to spend with Claude Coats. And now it comes down to the point at hand. I am not suggesting that I could be a mentor to you all, but that said, you should all have someone you can turn to in this manner. I do hope to be available to help support your ideas, give advice or even join a team whenever appropriate. My role will be one of supporting your visions in the best way I can, and encouraging you to maintain and build upon this already special place. I will have availability, and if you would like my assistance in any way, please e-mail Bruce Vaughn’s office to request my time. 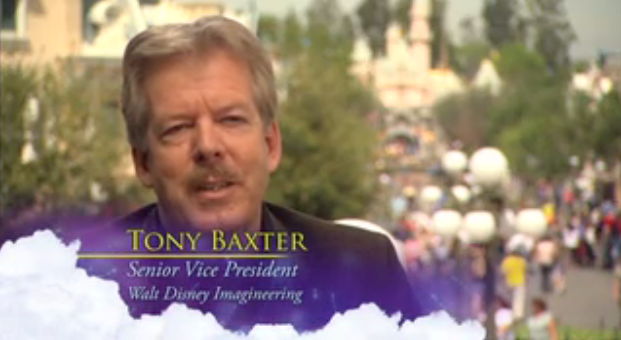 This entry was posted in Disney World, Disneyland and tagged Tony Baxter Resignation. Bookmark the permalink.